We’d love your help. Let us know what’s wrong with this preview of 31 Days To A Clutter Free Life by Ruth Soukup. Ruth Soukup knows all too well how stressful it can be to have a home packed to the gills, with an overbooked schedule to match. After years of overspending left her wallet painfully empty and her home painfully full, she realized it was time for a massive change. She began clearing her life—and her home—of clutter, one small step at a time. Now, over the course of thirty-one simple but powerful daily challenges she is sharing exactly how you can do it too. 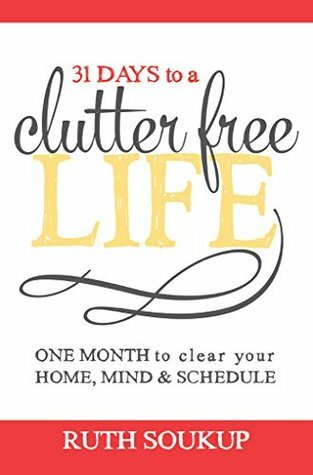 31 Days to a Clutter Free Life will empower and inspire you to clear your life of the clutter that is filling up your home, mind, and schedule, once and for all. Over the course of this one-month challenge, you can: Eliminate clutter in all areas of your home and instead create functional spaces for all of your family’s many activities. Replace chaotic counters and overstuffed cupboards with a calming kitchen that makes cooking a joy. Overcome the destructive cycle of always needing more by paring down belongings to those you truly love. Stop overcommitting and instead learn to say no without guilt. Reduce stress in your home and family by clearing out the excess stuff that takes up so much of your time and energy. Create practical and functional storage solutions for every room in your home. Develop a working control center that keeps your entire family organized and on track. Learn the four simple strategies to staying clutter free forever. What if, one month from today, your life could be different? Join thousands of LivingWellSpendingLess.com readers in completing this life-changing challenge. You can check in on the blog, or use the hashtag #LWSLClutterFree to share your own progress on Facebook, Twitter, or Instagram. Find accountability & get support of others who have committed to becoming clutter free as well. The challenge begins on LivingWellSpendingLess.com this October, but you don't have to wait. Get the entire challenge now in convenient book format. A clutter free life is waiting.....are you ready to embrace it? To ask other readers questions about 31 Days To A Clutter Free Life, please sign up. Basic organizing ideas. Black and white photos of organized areas. Checklists for each day. This book has some good ideas, but if you have read other clutter related books, you won't find a lot of new information. Personally 31 days will NOT get my house organized, especially my books!! There are so many amazing people on YouTube who have wonderful channels about decluttering and organizing etc. They are detailed and helpful, and really walk you through and give you so much great advise. This book literally had one template. Day #, a page about the importance of WHY to keep this area clean, and then the same template repeated EVERY single day but with a variation of words here and there. She literally copy and pasted it, and just filled in something here and the I'm sorry but no. This book literally had one template. Day #, a page about the importance of WHY to keep this area clean, and then the same template repeated EVERY single day but with a variation of words here and there. She literally copy and pasted it, and just filled in something here and there. That is it. NO EFFORT. She has a page full of photos for 'organizing idea' of what the space you are working on COULD look like after you are done. People, go to pintrest, search "organized closet" "organized kid room" "organized bathroom" etc. And you will have SO many better quality ideas, with color pictures and details! I'm sorry but after all the hard work of those YouTubers and I'm sure other 'declutterers' who have written books, this book is a sorry excuse. If you are new to decluttering, and I mean BRAND spankin new, you will pick up this book and possibly like it because you don't know any better. I don't like the idea of not finishing this book, but as other reviewers have said, the whole entire book just follows the same format and a lot of the information does seem to be copy and pasted for all 31 days, so there is actually very little information contained in the book. At first I thought my review might come off across as harsh because I compare all organizing books to Marie Kondo's, but no, after reading the reviews, I know it's not just that. Written by the author of a blog - I hadn't realized that until I started reading. A very basic and repetitive "recipe" for decluttering. Didn't work for me, but I can see some people enjoying the simplicity of following the checklist at the end of each "chapter" each day for a decluttering plan. I found somethings unrealistic do be finished in one day (like photographs) and could derail the whole project. Some days are fine - like a medicine cabinet can be tackled in a day successfully. I suppose for people who live in chaos this is new information? For me, there wasn't anything I hadn't heard, or read, or practised already. The typos were annoying. Obviously a self-published, previously blog-published collection of ideas. Read it only if you're at your wits' end with how to organize your home. You will probably find all of this info on her blog, save your money. This book was very simplistic and overly ambitious in terms of what she expected you to accomplish in one day. It felt as though it were geared towards people who had already decluttered....declutter all of your young child's toys in one day, that certainly isn't realistic for my household, which left me feeling demoralized rather than inspired. Simple, straight-forward guide with plenty of ideas to help you on your way to living a clutter-free life. Good book to help motivate but not as helpful as I had hoped it would be. I enjoyed this pratical, step by step guide on how to get rid of my junk! The daily challenges made the tasks manageable. Just reviewing many things I already knew about decluttering (a true talent in my household). Well organized with an inviting "chatty" written approach. It is time for us to tackle the clutter in our lives! We all have it, we all hate it, but most of us feel powerless to overcome it. This book is a fantastic is a step-by-step guide for regaining control of your “Cluttered Home.” This is the third book I have read by Ruth, and each one of them have empowered me to make necessary changes in my life. I also am a faithful reader of her Living Well Spending Less blog. In this book, Ruth divides the de-cluttering process down into simple and manageable It is time for us to tackle the clutter in our lives! We all have it, we all hate it, but most of us feel powerless to overcome it. In this book, Ruth divides the de-cluttering process down into simple and manageable daily tasks that are truly transformative. The challenges can be completed by dedicating 30-60 minutes per day over the course of a month, or you can choose to work through the process at your own pace. We live in a “have-more” society, and it is time for us to embrace the beautiful simplicity of a “have-less” lifestyle. It’s time to give up ordinary in order to make room for extraordinary. This book guides us through the process of doing just that. Can't wait to see what this author comes up with next. I could not get much useful info from this because the author had the same exact game plan, repeated word for word, for each room of the house! By the third room, rereading the exact same words became so boring I couldnt stand to finish the book! Sure, it may be a good plan, but we get it already! Stop!! It was OK. She saved the best for last, on day 31 the suggestions are "Stop the Flow, and Purge, purge, purge." I would have thought that would be day 1. Also, there's a lot of purchasing containers to hold the clutter. I think I don't want to buy anything, just get rid of it. Ruth Soukup has written a book in 31 Days to a Clutter Free Life that is definitely worth reading. She presents straight forward steps to help tame the clutter. Each day is broken down into easy-to-follow steps. I definitely recommend reading this book. I read this while on vacation and am looking forward to implementing it when I get home. I really like the way she has the tasks broken down. I may alter the order a bit because of the flow of stuff in my house, but i think the basic plan will work well for me. Good book with a good plan but all of my decluttering will take longer than one day so I don't think I'll get it all done in one month but I can at least make progress. . . Very helpful in easy to swallow bites. Ruth Soukup is a writer, photographer, DIY lover, passionate homemaker, and founder of LivingWellSpendingLess.com. Begun simply as a way to hold herself accountable as she attempted to replace her shopping addiction with a sustainable budget, LivingWellSpendingLess.com has since grown to be one of the top frugal lifestyle blogs on the web, averaging over 700,000 unique visitors and 1.4 million pag Ruth Soukup is a writer, photographer, DIY lover, passionate homemaker, and founder of LivingWellSpendingLess.com. Begun simply as a way to hold herself accountable as she attempted to replace her shopping addiction with a sustainable budget, LivingWellSpendingLess.com has since grown to be one of the top frugal lifestyle blogs on the web, averaging over 700,000 unique visitors and 1.4 million pageviews each month. She has contributed to articles in Woman's Day magazine, Redbook Magazine, The Chicago Tribune, and ALL YOU Magazine, has appeared on The Daily Buzz, and is a regular contributor to Proctor & Gamble's HomeMadeSimple.com and P&GEveryday.com websites. She also writes a feature column for Harbor Style Magazine and appears regularly on WINK News in SW Florida as a Money Saving Expert.